Head Lice and Back to School usually go hand in hand. 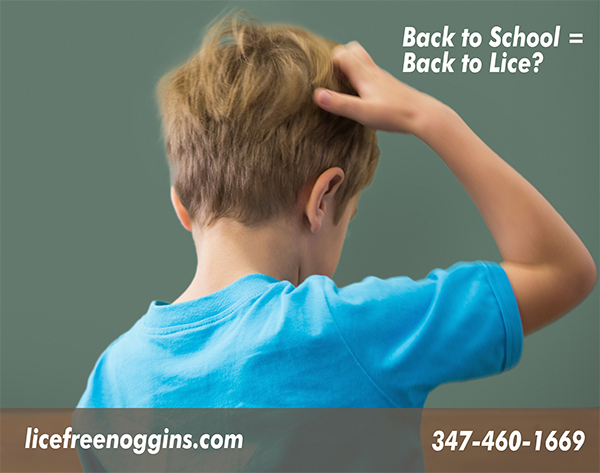 Head lice exist year round, but the number of cases peak as kids return to school. When kids go back to school, so do nits. At the start of the school year, when kids return from summer camp, they have a higher risk of carrying head lice. This year we will be seeing an increase in number of head lice cases among school age children as lice have grown immune to standard chemical lice treatments. Parents who use these over the counter chemical treatments are often surprised by its ineffectiveness. We get calls from a lot of discouraged families, who were unsuccessful with over the counter treatments. In order to truly eliminate a case of head lice, you have to get rid of all of the eggs. That is a labor intensive process and only a professional technician can recognize eggs that camouflage in the hair. That’s where LiceFreeNoggins comes in. Our techs are experienced and use all-natural lice treatments that are backed with a full guarantee. It makes sense to use a professional to get the job done properly the first time. Call to schedule an appointment today at 347-460-1669. Check for Lice and Nits – Checking your child’s hair regularly means you can spot head lice at the very first sign and treat them effectively. Read more on how to identify head lice and nits. Treat the head lice as soon as you spot one – The longer you leave it, the more likely they are to spread to other family members. As soon as you see a live lice check the rest of your family members. Double Check – After you have treated head lice make sure you continue to check again, after three to five days, and again ten to twelve days after using the treatment. Tell Your School and Friends – It may seem embarrassing but it is such a common problem and other parents need to be aware of and will appreciate. By not sharing you are running the risk of reinfecting your now lice-free child. Still don’t feel like sharing? Use our anonymous head lice notification form to send an anonymous note to school or friends. Remember, head lice are not dangerous and are not a sign of poor hygiene, if your child does have head lice, it will need to be treated with a head lice treatment or with one of head lice removal methods.